OMG! That's a lotta twisty puzzles! "Does that make me craaaazy?" During my email conversations with Jon (SuperAntoniovivaldi), Rline and Burgo, it quickly became clear that I have developed a new and extremely rare medical condition! This new condition is quite contagious (judging from the responses of a few nearby puzzlers) and is called "Twisty fever"! I started off in the 80s (yes! I am that old!) having solved the standard 3x3 and 4x4 cubes but that is as far as it went. Now, in my "middle years", and supposedly having grown out of all that nonsense, having rediscovered puzzles via the revomaze forums (world renowned blogger Allard always says that I should blame Oli (another internationally famous puzzle writer) but we all know that all of this is his fault really!!) I decided that I should at least be able to do 1 or 2 basic cubes and so quite early on in my collection I bought a few basic cubes and quickly rediscovered a few techniques. I then decided that I should try a few more and managed to solve those as well! "I'm a genius!" I thought! So I bought even more and hit a wall. At this point I found the Twisty Puzzles forum (this forum is more aimed at solvers of difficult puzzles and new designs rather than speed cubers) and YouTube and at this point the virus really hit! I'm now the proud owner of more than 70 twisty puzzles including a few which have been handmade at, let's just say, slightly painful expense! This sudden massive expansion of the collection is a cardinal symptom of twisty fever and I'm afraid that there is no cure!! The only good thing about it is that, by and large, these puzzles tend to be reasonably priced (until you end up buying bespoke or Shapeways puzzles) and even more importantly these puzzles don't jingle and annoy the present Mrs S! At least until they become so numerous that they erupt out of my study and contaminate the rest of the house!!! So why the title of this blog? It's true that twisty fever makes you go crazy but that is actually not the reason. Speaking to my puzzle friends they all really extolled the virtues of a particular group of puzzles - these are the Crazy 3x3 planet cubes and the Crazy 4x4 II. They apparently provide the challenge of several puzzles in one and also are a series of very similar looking puzzles with hugely varying solution strategies! In my twisty fever haze - I was hooked! I had to get them!!! It is a relatively expensive puzzle by twisty standards (approx $45) but well worth it, especially as it is high quality, turns well and tiled rather than stickered. It is a 4x4 cube with central circles which do not rotate with the face. The circle does, however, rotate with the 2nd layer - this bewildering thing occurs on every face! When it gets scrambled it looks unbelievably difficult! Just remember that there is very little here that is new - you just have to use techniques from several puzzles sequentially to solve it with just a little twist (!) here and there. You'll love it! The central 2x2 square functions as a 2x2x2 cube - fantastic - I can do a 2x2x2! I initially solved this central minicube but then it took me a whole day to work out how to align the tiny pieces outside it (I could get a few in place but then moving some would move others out). Finally I had a very nice little eureka moment and all my inner circles were done! At this point it is time to solve exactly like a 4x4 cube by reducing to a 3x3 with edge pairing etc. the usual parities can occur to add to the fun. This particular puzzle misbehaves a little by having a very unique parity problem! It is just the same as a normal 4x4 but the usual approach does terrible things. It took me a week to discover how to deal with this specifically and I ended up adapting the corner pieces series from Rline's site to finally be able to say I can deal with every aspect this wonderful puzzle throws at you. If you want an extra challenge then this one is fabulous! 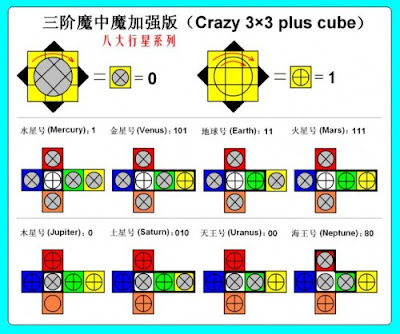 Next up we have the Crazy 3x3 plus planet series. I have a stickered plastic one because the original all plastic versions were sold out worldwide but when they suddenly became available, I bought the lot. There are actually 8 in the series but it is possible to buy just 2 select ones and then make any of the series from those 2. I did have 2 of the black versions but sacrificed the easy one to make the more interesting one in the series. The whole set came to rather more than I have told Mrs S but she doesn't need to know does she? This diagram basically shows that whilst all the faces have central circles, a varying number and distribution of them are attached or bandaged to the outer face (i.e. turn with it) - this makes for a bewildering set of challenges! I have to say that I found this rather incomprehensible at first and so asked on the Twisty Puzzle forum (link to question and responses) what order to take them in and had several points of view given one of which I followed and I think it was correct. I did get lulled into a false sense of security with the first 2 - I started with the Jupiter (just a single unbandaged face and quickly discovered how to reconnect the tiny circle pieces with their corresponding edges and then it can be solved as a normal Rubik cube with a small restriction. Yet again, I get that "I'm a genius" feeling and so started on the next one - the Uranus (2 unbandaged faces) and tried the same approach. Not quite so easy but after working out what was the problem this was also an easy solve! "I really am a genius!!!" Next I tried the Mercury cube (all but one face unbandaged) and got a hell of a shock! I had absolutely no idea what to do! Nothing I had previously done would work. Eventually, after reading around a bit I had a few new ideas to play with and gradually worked it out. This was a real challenge and very enjoyable. During this working out period I discovered that there were a number of general approaches. Most people and originally solved them by solving the internal cross, then the external cube and finally pairing up the little circle corner pieces. It was a real challenge to work out sequences which would move the relevant pieces around without destroying the rest of the cube and I used almost a whole pad of paper writing down various algorithms I tried out before settling on the one I liked. Whilst this circle corner last technique is fun to work out, it is not a fun solve - I find it quite laborious! The most enjoyable way to approach these is to try to reduce the cube back to something simpler (either a circle cube or a Rubik cube) - I can do this with all of them now - and it has taken some work! The last of them for me was the Saturn - it has 2 unbandaged faces opposite each other and this one almost killed me! I struggled for a week before finally working it out - I couldn't even get all the crosses let alone a reduction technique! Having finished the series - I almost feel a sense of loss! Another symptom of my being craaaazy? Maybe, but I have already found a few more to occupy me!!! I have summarised how to approach this magnificent series of puzzles in a table - if you would like a copy of this table than just contact me. Should you buy these? Oh yes most definitely - I would buy these in a heartbeat! If money is tight then it is possible to buy 2 of the series that are mirrors of each other (i.e. have the same number of bandaged and unbandaged faces) and using them you can create any of the series. However, you will soon get hooked and want to actually own the rest of them!!! RESPECT on the Twisties though - you're way ahead of me there! Catch up Allard! You know you want to! I have a thing for twisty balls (yeah, yeah,yeah!). I am currently looking at getting a Dioctipoid. No puns please! I also prefer white plastic versions of the puzzles I buy, or full colour plastic. I have found I have had to buy up to 5 puzzles to find a puzzle that I am happy with, such is the range of quality across some puzzles. I'm afraid I agree with Tony Fisher - most puzzles are best in black plastic! Although for function I do like the multicoloured plastic puzzles! Currently building up a list of yet more to buy I am particularly interested in getting a gigaminx, teraminx and petaminx! Unfortunately that will come to about $370!!! There are lots more new and different ones to buy too! I think you will have no problem solving the Jupiter! You only have to learn one new and rather interesting thing to do and then it is no problem! I don't have a master skewb but I think that Jupiter will be much easier. He's mad!!! Mad I tell you!!! I know! But it feels good to have it out in the open! All solved, too! This is even more impressive than the number, to me. I have a 7x7x7 V Cube but have been so afraid of it I have never mixed it up! Don't be afraid of it George! It's not that hard really! It's more arduous than anything. If you can do a 5x5 then the 7x7 is just a bit longer. There are plenty of tutorials if you want one online. Don't make me shout across the Atlantic!!! Go to this site from Rline and learn the EASY way for all cubes!! I have failed as a puzzler. You're not trying hard enough Neil! An advanced puzzler of your calibre can easily cope with a cube or 60! I'd suggest looking at Rline's ultimate solution site for an easy basic approach which requires only 2 algorithms (both really easy to remember) and plenty of thought/strategy? Then I'd look at SuperAntonioVivaldi's YouTube channel for some video viewing. It really doesn't take long to learn the basics and then apply them to more and more complex puzzles. The possibilities are endless - it is another whole world of puzzling to enjoy! You are indeed crazy Kevin, but just so you know, I fully support you in your insanity. My twisty collection is growing, but not at anywhere near the rate of yours. We're going to need to see a full collection picture soon! Also, I'll happily take responsibility for your puzzle madness. But if your wife asks I will immediately deny all knowledge! The full twisty collection is at the top of this post - I think that's most of them! There were a few that I couldn't find! Not sure I could get a picture of my whole puzzle collection in! It's now to huge! I love it!